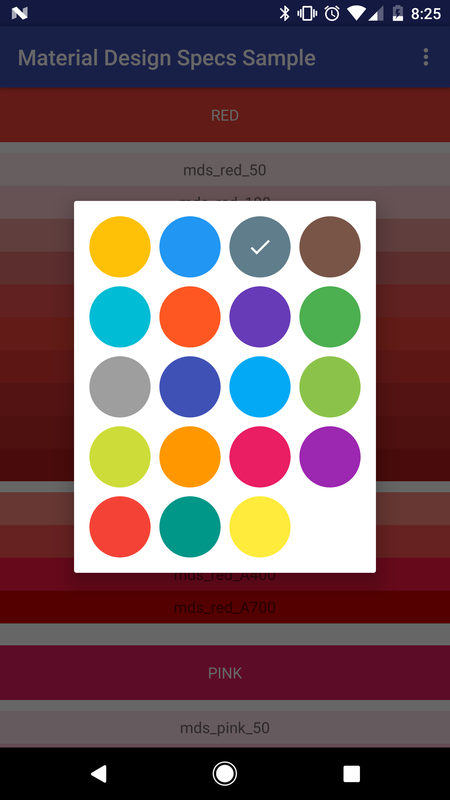 Now, you'll be able to access the full color pallete from material design, either by XML, or programatically. // Access it through the android R file. Like the examples below. getColorsByName(String colorName) // Returns a List<Integer> of colors with the given name. // The methods below returns an Integer to use along your code. // And a few more! Note that depending on orientation or screen size, you may want to consider how many columns you add to the GridLayoutManager. For example, 5 columns on a Nexus 6P begin to overlap and don't look god together. Here's the list of the colors names. Change "X" to the color level, like "50" or "A100". 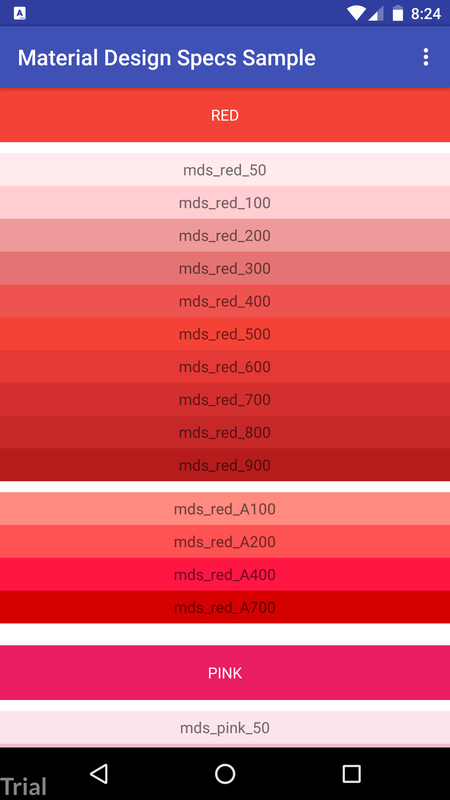 Example of a color: mds_orange_A400. Reminder: brown, grey, and bluegrey don't have accent colors. The full color palettes as well as some more information on how to use them can be found in Google's Material Design Specifications. To know which elevation value to use, please refer to the material design specs. With special thanks to Eric Cugota for helping us get this into Bintray and make it available for you. And it's released under Android Essence blog. If you contribute to this library, please add yourself to this section when you submit your pull request. Material Design Specs Lib is available under the MIT License.